The KarlGoetz.com Collection was begun in late 2003 shortly after our first encounter with a Karl Goetz medal. The medal, K-262 "Die Wacht am Rhein!! : Die Schwartze Schande", completely caught us off guard and we immediately needed to know more about the artist and why he would create such a piece. As we explored further we entered into the largely unknown and incomprehensible, both in number and beauty, suite of artistic works created by Karl Goetz. Our first goal was focused on obtaining the two Gunter Kienast reference books; 'The Medals of Karl Goetz' and 'Goetz II: A supplement to the Medals of Karl Goetz', both, required reading for any serious Goetz collector. With books in hand, we have scoured the web and most auctions held both in the U.S. and internationally in Germany and Great Britain. Suffice it to say, this collection most certainly would not exist had there been no internet or computers. Initially we tried to acquire just about anything that became available but soon realized it would never be possible to have a complete Goetz Oeuvre Katalog due to both budgetary and availability constraints. Our focus quickly changed to obtaining the more obscure pieces Goetz created; his creative process artifacts (concept sketches, models, moulds, etc. ); and, personal ephemera such as Goetz's medal cabinet, engraving tools, documents, and personal writings. You can view these additional examples in their respective Paris Period and Ephemera gallery albums. Additionally, our collection holds the entire WWI satirical series which can be found in the WWI gallery album. 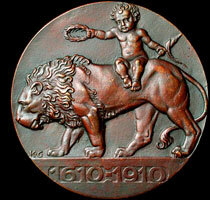 The KarlGoetz.com collection numbers approximately 500 examples of Goetz's medallic and coin pattern work. The collection spans all 'periods' of Karl's work from 1890-1949, some more than others.